The Acadian orogeny was first recognized in the 19th century in the severely deformed and metamorphosed rocks around the Bay of Fundy, Nova Scotia, Canada. At its peak it formed a continuous chain of mountains along the east coast from southern Virginia north to Newfoundland, where it connected with another chain of mountains, the Caledonides, that continued on for thousands of miles more between Greenland and the Scandinavian countries . The Caledonian and Acadian orogenies created the supercontinent Laurussia, also known as the "Old Red Sandstone" continent ("Old Red" map). The Acadian orogeny occurred near the beginning of a major period of mountain building in earth history lasting for the next 150 million years. In time practically every continent will be affected. At the same time sea level was rising and the Kaskaskia sea, entering from the Gulf of Mexico, spread north across North America placing most of it under water. Eventually it lapped onto the inland margins of the Acadian mountains in the east and the Antler mountains in the west (Nevada). The Acadian orogeny occurred when the Armorica terrane, traveling along an east dipping subduction zone (modern direction), collided with North America. Armorica originally included portions of Great Britain and southern Europe, but during the Triassic rifting that opened the Atlantic it was torn in two; the portion remaining with North America is Avalon. Avalon added to the Mid-Atlantic all the land lying under the coastal plain province, east of Richmond and Washington, D.C. and out to the edge of the continental shelf (province map). We will use the term Avalon from this point on even though until the Triassic it is technically still Armorica. Avalon did not hit North America head on but slid in obliquely from the southeast, something like a baseball runner sliding into home plate. The North American coast, although not as irregular as during the Taconic orogeny (Stage H) still had projecting irregularities that Avalon struck hardest. The result is a ragged, "hit and run" type of mountain building that began in the north and migrated south through time. The northern collision in the maritime provinces of Canada is recognized primarily by the severely deformed igneous and metamorphic rocks of Nova Scotia, with sediments spreading southward. The third and last, Pocono impact, (called the Price in the south) was smaller and took place in southern Virginia. It produced a small foreland subsidence and a moderate volume of sediment spreading west and north from the collision (map). As with the Taconic orogeny in the Mid-Atlantic, we are most aware of the Acadian from the sedimentary record, and the thick accumulation of clastic sediments that are spread throughout the western Valley and Ridge and eastern Allegheny plateau (province map). But, eastern Virginia also shows the effects. There is evidence a large volcano existed in the Richmond area, and a large number of igneous plutons intruded into the eastern piedmont with the Acadian orogeny (e.g. the Petersburg granite; piedmont belt map, or dark green on the geologic map). Metamorphism and folding also affected the piedmont during the orogeny. But as with all orogenies, once the collision is done the only thing remaining is for the mountain to erode and the foreland basin to fill with sediment. By the Mississippian, deposition of the Greenbriar carbonates tells us the orogeny is over. With the Acadian orogeny all of the Mid-Atlantic real estate we know is finally present, although not looking anything like today. Instead you have to imagine the great Acadian mountains in the east, towering above the cities of Emporia, Richmond, Fredricksburg, Washington, and beyond (map). All of the rocks these cities now sit on were, in the Devonian, the roots of the Acadian mountains, and the mountains themselves towered thousands of feet above where we can stand today. And to the west running though the Valley and Ridge province and the Allegheny plateau was the foreland basin, with rivers carrying all the eroded sediment down to the coastline where much of it then flowed into the deep parts of the basin. And beyond that was the Kaskaskia epicontinental sea, stretching all the way from central Pennsylvania and West Virginia to Nevada (environmental map). Standing on that ancient shoreline at the Virginia/West Virginia border one can imagine looking west across the vast inland sea, with nothing between us and the Antler mountains in Nevada but the sea. It is almost as if everything today were reversed; the mountains are to the east, and the shore and ocean to the west. The Acadian orogeny is not as complex in its foreland basins and mountain structure as the Taconic (Stage H), but its rocks are more widely and obviously exposed, and we know a lot about the environments, and climate, and life of the time. Still, in our area it consists of two pulses, and two clastic wedges, and has a rich story to tell us. So we begin with the clastic wedges. As far back as 1913 Joseph Barrell drew a map clearly showing the Acadian mountains in New Jersey and southeastern New York, and the clastic wedge spreading westward across New York, Pennsylvania and south toward Maryland, West Virginia, and Virginia. Barrell called this clastic wedge the Catskill delta. The "Catskill delta", however, contains no true "deltas" in the sense we use the term today for, say, the Mississippi delta, or the Nile delta (J1). For this reason the term Catskill clastic wedge is more accurate, and we use it here. The Catskill foreland basin is best developed and deepest in eastern Pennsylvania and adjoining New York, but shallows relatively quickly toward the west and southwest. By western Pennsylvania and West Virginia the foreland basin has reached normal cratonic depths (several tens of feet down to perhaps a hundred feet or so, depending on the level of the Kaskaskia sea), and we are in fact no longer in the foreland basin. Evidence of the shallowing toward the southwest is in the thickness of the sediments. Near Winchester the clastic wedge is about 8500 feet thick. By White Sulfur Springs, West Virginia it has thinned to about 5000 feet, and at Big Stone Gap, far southwest Virginia, it is only 1000 feet thick. Off into Tennessee its thickness is measured in 10's of feet. 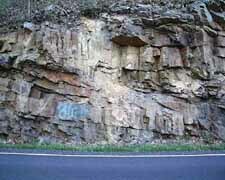 Good outcrops of the clastic wedge are found throughout the western Valley and Ridge, but develop more completely along the Allegheny Front in West Virginia at the edge of the Allegheny plateau province. The eastern most outcrops are found in Fort Valley within the Massanutten mountain. Between these rocks and the Avalon terrane to the east there is no stratigraphic record. The history of the foreland basin is found in the sequence of formations that make it up. They are shown in the (stratigraphic section), and in this reconstruction of the foreland basin. With the onset of the orogeny the foreland basin subsided rapidly. We see this looking at the stratigraphic record. The Oriskany white, quartz sandstone (right, and stratigraphic column) lying directly under the clastic wedge indicates tectonic stability. But right on top of it are the Needmore and Millboro formations (below), deep water black shales. It is as if the floor just dropped out from under the Mid-Atlantic region like a trap door (J 2). But, of course, the foreland subsidence accompanies the rise of the Acadian mountains, and these two coupled events indicate the geologic speed of the collision. As the Avalon terrane, the hinterland, overrides eastern North America along a suture zone to create the mountain, it depresses the continent down with its weight in the process of sliding upward. And once the basin is down it begins to fill with sediments eroded from the mountain. The Catskill clastic wedge progrades (J 3) out into the basin; that is, fills it in with sediment from east to west. At first the environmental systems near the mountain are short, braided rivers quickly flowing down to a narrow coastline, and then dumping large volumes of sediment directly into the basin as underwater avalanches (turbidity currents). The tubidity currents build a submarine fan (environmental map) preserved in the Brallier formation. The right picture is of a few of the brallier turbidite deposits (called Bouma sequences); each sand/shale couplet represents a single turbidity current. There are many thousands more. The turbidity currents only flow so far, however, so distally, away from the lower edges of the fan, are the black shales of the Needmore/Millboro formations deposited in the deepest parts of the basin. You can see this in the cross section where the sloping surface of the Brallier formation changes down slope into the deepest basin shales. But progressively, flood by flood, the sediment fills the basin, building (prograding ) the clastic wedge out toward the north west, and stacking the environments (formations) on top of each other. And as it does, the environments begin to elongate. The red rocks of the now meandering rivers (Hampshire formation; Catskill in Pa.& NY) grow longer and longer, and become more sluggish as they bring their sediment load down to the coast. In the left picture, for example, the blocky sandstones are the river channel deposits, and the silts and muds under them flood plain deposits. Flood by flood the flood plain silts/muds are deposited, accumulating thicker and thicker. And through many floods the rivers migrate across the flood plain depositing the channel sands as they go. Flood by flood, sweeping back and forth the deposits accumulate until they reach 2000 feet thick, and many tens of miles wide. Likewise, the shelf environment (Foreknobs formation), beginning very narrow, grows wider and wider as the clastic wedge progrades. By the time the clastic wedge reaches central Pennsylvania and West Virginia it has pretty much filled the foreland basin. And then the sediment starts to spill out into the Kaskaskia sea, onto the craton. But by this time the supply of sediment is diminishing rapidly as the eroding mountains approach sea level (environmental map). It would seem at this point that the orogeny is over and we would expect a transition into an interorogenic calm. The clastic wedge should sink below sea level, and quartz sand and/or carbonates should appear in the stratigraphic record. But the mountain building is not quite done yet; there is one final gasp - the Price/Pocono. 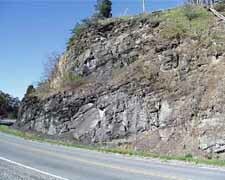 In far southwest Virginia most of the thousands of feet of thickness of the Catskill clastic wedge to the north (Needmore, Brallier, Chemung, Greenland Gap formations), is represented by a black shale sometimes only 3 meters thick, the Big Stone Gap Member of the Chattanooga formation. When the last of it is deposited the last of the Catskill clastic wedge is deposited. What is important, though, are their relationships to the Catskill clastic wedge. In northwest Virginia and West Virginia, for example, much of the Pocono formation was deposited on shallow tidal marine shelves or in near shore deposits (beaches, estuaries, tidal flats, and marshes - represented by coal beds). The picture to the left is of a tidal shelf sand bar near Raleigh Springs, Va.
More important these gray sandstones and gravels lie directly on top of the red, terrestrial, river deposits of the Hampshire formation. This is significant because for the past 20-25 million years, a vast volume of sediment has flowed from the eroding Acadian mountains, prograding westward and filling in the foreland basin. But, now the Pocono shore line is transgressing eastward, drowning and burying the Hampshire river sediments. The fact that this transition from Hampshire to Pocono can occur tells us that the Catskill mountains are eroded enough that sediment flow has slowed to a fraction of its former rate, and a small rise in relative sea level can push the shore line eastward toward the base of the former, but now nearly eroded, mountains. With this last pulse, this last clastic wedge, the Acadian orogeny is over. In the Silurian eastern North America lay in the tropical deserts. But by the Devonian Virginia has drifted northward and into the trade wind belt between the equator and about 20o south of the equator ("Old Red" map). This results in a change in climate from desert to a humid equatorial belt with steady winds blowing out of the east, and abundant rainfall. But with steady winds and abundant moisture would we not expect lots of rain, lots of waves, in the foreland basin? Not necessarily; it depends. Look at the position of the Mid-Atlantic region in the Devonian (map). The trade winds do blow out of the east, across the Rheic ocean, toward Virginia. And along the way they pick up lots of moisture. But as the winds blow onto North America the first thing they meet are the Acadian Mountains. The winds are forced to rise. As they rise the moisture laden winds cool, form clouds, and dump large amounts of rain on the eastern flank of the Acadian mountains. This type of rain is called orographic rain (because it is caused by an orogen, a mountain), and it means the eastern Acadian mountains are embedded in clouds and bathed in torrential rainfalls and continuous mists (cross section). It is also quite possible this effect is seasonal (monsoonal) that is, heavy rainfall for several months, and then no rain for the rest of the year. If this were Virginia today the area of orographic rain would be somewhere above Richmond and the coastal plain (cross section). But, on the western flank of the Acadian mountains, above the present day Shenandoah valley and westward, conditions are very different. Most of the moisture carried by the trade winds is dumped on the eastern flank of the mountains so that little remains in the clouds as they cross the mountain crest. And as the winds descend and warm they get even drier. The western flank of the Acadian mountain is in a rain shadow. It may even have been desert-like part of the year, except along the river banks of the Hampshire meandering river where vegetation could tap into the deep reserves of underground water. It is also quite likely that pulses of mountain building raised the mountains so high no rain could cross over the top for a time. Furthermore, because the winds are the trade winds they tend to blow steadily from east to west. That is, in the Devonian Catskill coastline they blow steadily from the land toward the sea. Such offshore directed winds do not create a lot of onshore directed waves. Furthermore, just offshore from the clastic wedge, out in the epicontinental sea, we quickly enter the equitorial region, and the doldrums. These Devonian climatic conditions have great effects on the environments developing in the clastic wedge and the epicontinental sea. Many interesting things happen during deposition of the Catskill clastic wedge. But always one of the things we want to do is try to reconstruct a picture of what the world would look like if we could have stood there and looked around. In the "Further Details on this Event" page we explore three case studies to capture the flavor of the environments in the Mid-Atlantic during the Acadian. By this point in the geologic evolution of the Mid-Atlantic you may have observed that each event seems to be uniquely different, even strange. Lost in the details it is easy to become disoriented, to think, to believe there are no patterns, no meaning to all this. Thus, it is one of the great triumphs of generations of work that patterns have been found in the geologic kaleidoscope. We have seen two orogenies now, the Taconic and the Acadian. And even for all their unique differences they do have similarities. For example, subsiding foreland basins that fill with clastic wedges, and carbonates or quartz sandstones below and above the clastic wedge. And we know, of course, that at very large scales there are Wilson cycles. Well soon, with the next orogeny (Alleghenian) one Wilson cycle that began in the Cambrian is about to end. But the earth still has a few more surprises for us, so let us continue on, pausing next for a brief Mississippian calm before the next orogeny.